In the figure below, I show the predicted probability of attending a party meeting for four different scenarios. Take two general scenarios. The scenario shown in the upper left is for a respondent who self-reports being a survivor of a criminal and/or violent action. This respondent is a prototypic middle-aged (45 year old), highly educated woman. Herein, we see that the highest level of kinship connectivity is 22% more likely to participation in a party meeting. This effect is quite strong. The second scenario, represented in the top right quadrant, maintains the victim status but represents a young (25 year old), male with lower education status. 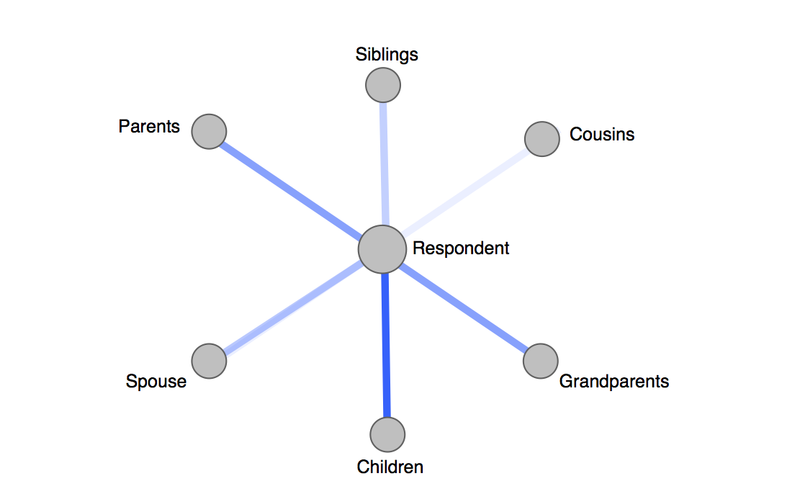 Respondents in this scenario are 11% more likely to participation in a party meeting, if they have a high (as opposed to low) level of kinship connections. The effect remains substantial. The lower half of the figure represents the same two scenarios but for non-victims. Here we see that family ties have a different effect for non-victims in that stronger family ties actually lower participation. This finding echoes a similar finding by Alesina (2011) which suggests that kinship networks can offer an alternative institutional setting for investment and reciprocal benefits. Those with strong family ties participate less in their communities because they require less support from these kinds of external institutional settings. 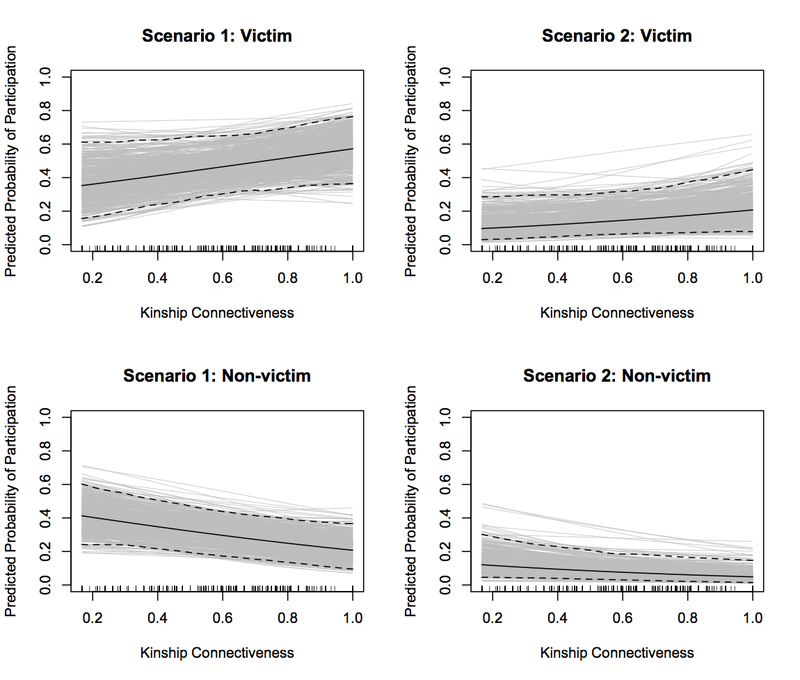 These results show that there is an important and influential interaction between the two conditions of victimization and close kinship ties. Victims do not just turn inward to the institution of family, but use it as a launching point to engage in pro-social political behavior outside of their family network. These findings support the idea that social context matters for understanding the behavior of civilians during an armed conflict and suggest that families act as support groups for individuals and enable them to become engaged within society, instead of turn away from it. Victimization of civilians is not unique to Mexico. Drug wars, insurgencies, and other forms of civil conflict are prevalent throughout countries across the globe. Though the type of armed conflict that is currently on-going in Mexico might vary from numerous others, in that the violence is decentralized in nature, the implications of this research extend elsewhere. Clearly, the Mexican case is similar to regions like Colombia and Peru, which have experienced various waves of decentralized criminal conflict. Yet beyond direct country comparisons, it is important to note that the key finding of this study presents an important new framework for future studies in insecure environments. The essential idea–that social context matters for understanding political behavior during armed conflicts–can be extended to a variety of cases and will likely alter the field’s current notions about the link between victimization and participation in armed conflicts. In all, this study encourages researchers to stop trying to generalize about the effects of political violence on political action without exploring the moderating effects of the social environment. Find out more at cassydorff.com.